Department of Biochemistry, Biotechnology and Bioinformatics, Avinashilingam Institute for Home Science and Higher Education for Women, Coimbatore - 641043, Tamil Nadu, India. ABSTRACT: Proteases are one of the most important enzymes in many industrial applications, particularly as additives in laundry detergent industry. Hence, the present study investigates the isolation and purification of an extracellular protease from the Bacillus subtilis ASASBT isolated from termite soil sample. Among the five protease producers, one of the isolates was selected for further studies. It was related to Bacillus subtilis on the basis of 16S rRNA gene sequencing and biochemical properties. The maximum protease activity recorded at 48 h of incubation at 37°C was 154.13 U/ml. Based on the maximum activity of the enzyme, further optimization studies were done with Bacillus subtilis ASASBT. Its optima pH and temperature of enzyme production were pH 7.0 and 40 °C, respectively. Starch and gelatin were the best carbon and nitrogen sources for the production of protease. The isolated protease was purified in four steps involving ammonium sulphate precipitation, dialysis, DEAE-Cellulose and sephadex G-100 chromatography had a 4.01 fold increase in specific activity (86.51 U/mg) and 23.73 % increase in recovery percentage. These properties suggest that protease from Bacillus subtilis ASASBT could find potential application in various industries. INTRODUCTION: Enzymes are considered as a potential biocatalysts produced by living cells to bring about specific biochemical reactions generally taking place the metabolic processes of the cells 1. The production and purification of enzymes is central to the modern biotechnology industry, and to produce environmental eco-friendly products and product outputs chemical process are being replaced by enzymes like proteases 2. Proteases are ubiquitous in occurrence, present in all living organisms, and are essential for cell growth and differentiation. 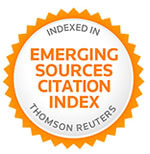 Microbial proteases represent one of the three largest groups of industrial enzymes and have traditionally held the predominant share of the industrial enzyme market account for approximately 60% of total worldwide sale of enzymes 3. Nearly, two-third of commercial proteases are produced by bacteria, fungal species and yeasts 4. It is one of the most important industrial enzymes and are used in a variety of industrial applications, such as detergents, pharmaceutical, leather, food, textile and so far, silver recovery from x-ray films and also in waste processing industry 5. It is worthwhile to screen microorganisms from new habitats for proteases with novel properties to meet the needs of rapidly growing various industries 6. Among the various proteases, bacterial extracellular proteases are the most significant, compared with animal, plants, viruses and fungal extracellular proteases. In the present study, we have carried out the isolation and purification of an extracellular protease from a newly isolated strain of Bacillus subtilis ASASBT. The purification process also increases the specific activities of enzymes and making them more specific for industrial applications. The enzyme has been used as an effective additive for the industries, which could be useful in the food, pharmaceutical, detergent, silk, for recovery of silver from used X-ray films and leather industry and can be exploited commercially 7. Isolation and Screening of Microorganisms Producing Protease: The termite soil sample was collected from the agricultural area in the Karur District. 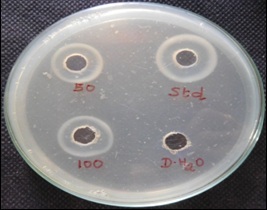 Protease producing microorganisms were identified by a clear zone of skim milk hydrolysis around colonies. The isolation was performed by serial dilution followed by spread plate technique. It was diluted to ten-folds and 0.1 ml from 10-4 dilution was plated directly on skim milk agar and the plates were incubated at 37°C for 48 h. After incubation, largest clear hydrolytic zone forming bacterial strains were selected for further studies and the protease producers were then sub-cultured on to nutrient agar plates in order to obtain pure isolates of bacterial species and maintained at 4 °C. An isolate “T1” showing maximum caseinolytic activity was selected for protease purification. The isolate was identiﬁed as the genus Bacillus based on various morphological and biochemical characteristics as per Bergey’s manual of systematic bacteriology 8 and confirmed as Bacillus subtilis ASASBT by 16S rRNA gene sequencing. 16S rRNA Sequencing: A molecular identification /genetic analysis of the selected isolate were achieved by 16S rRNA gene sequencing. The 16S rRNA sequencing was done at center for bioscience and nanoscience research, Coimbatore, India. DNA extraction was performed by CTAB method 9. Sequencing was done using forward primer (8f5´-AGAGTTTGATCCTGGCT CAG-3´) and reverse primer (1541r 5´- AAGGAG GTGATC CAGCCGCA- 3´). Sequence comparison with gene sequence database was performed using BLASTn program through the NCBI website 10. The evolutionary history was inferred using the Neighbor-Joining method 11. A phylogenetic tree was constructed with MUSCLE 3.7 12. The sequence has been deposited in the GenBank database in NCBI under accession number MF618325. Production of Protease from Bacillus subtilis ASASBT: For the protease production 24 h fresh culture of isolated Bacillus subtilis ASASBT was inoculated into a medium containing 1% glucose, 0.5% casein, 0.55% yeast extract, 0.2% KH2PO4, 1% Na2CO3, 0.2% MgSO4.7H2O, pH 8.0 and incubated at 37°C for 120 h in an orbital shaker with 150 rpm 13. The culture was centrifuged at 12,000 rpm for 10 min at 4 °C. The culture supernatant obtained was used as the enzyme source (crude). Quantitative Determination of Protease Activity: The protease activity in the culture filtrate of Bacillus subtilis ASASBT was assayed by the slightly modified method of Gaurav et al. 13 In a mixture containing 0.5 ml of 0.5% casein as the substrate and 1 ml of cell-free culture filtrate as the enzyme source. The mixture was incubated at 37°C for 10 min, and then 5 ml of 100 mmol/l trichloroacetic acid (TCA) was added to the reaction mixture to terminate the enzyme reaction. The reaction mixture was centrifuged at 5000 rpm for 20 min, and the supernatant was collected. To 2 ml of supernatant, 5 ml of alkaline solution (500 mmol/l of Na2CO3) and 1 ml of 25% folin phenol reagent were added and the mixture was incubated at room temperature. After 30 min, the protease activity was read at 660 nm in a spectrophotometer. Simultaneous controls containing enzyme, heat-killed enzyme and substrate were maintained. One unit of protease activity was defined as the amount of enzyme required to liberate 1 µmol tyrosine/ ml/ min. Qualitative Analysis of Protease by Plate Assay Method: The extracted enzyme was further confirmed on casein agar plate for the presence of protease. 0.5% casein agar plate was prepared and wells were made (40 mm). To the well 50 µl, 100 µl of purified sample and 50 µl of standard and sterile distilled water were added respectively. After 24 h of incubation at 37 °C the clear zone was measured and confirmed the presence of protease enzyme 13 - 14. Determination of Proteins: Protein content of the enzyme preparation was measured by Lowry’s method 15 using bovine serum albumin as the standard. The concentration of protein during purification studies was calculated from the absorbance at 280nm. Process Optimization for Maximum Protease Production: The Bacilus subtilis ASASBT strain was subjected to different culture conditions to select the optimum conditions for protease production. Protease production was estimated at various pH, temperature, carbon and nitrogen sources 5. Effect of pH on Protease Production: A wide pH range of 5 to 10 was used to study the optimum pH for protease production. For the analysis, 100 ml of production media in 5 conical flasks were taken. The pH of the media was adjusted to 5.0, 6.0, 7.0, 8.0, 9.0 and 10.0, respectively using 1N HCl and 1N NaOH. 24h old culture was inoculated and incubated at 37°C for 48 h, after incubation enzyme assay and biomass were estimated 16. 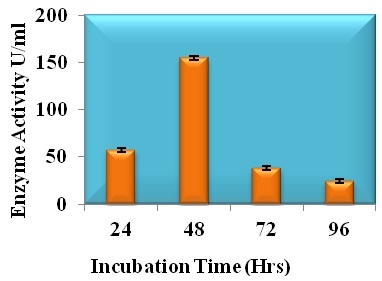 Effect of Temperature on Protease Production: The production medium at pH 7.0 was inoculated with 24 h old culture and incubated at different temperatures from 20°C, 30ºC, 40ºC, 50ºC, 60ºC and 70ºC for 48 h. At the end of incubation period the cell free culture filtrate was used for the enzyme assay and biomass estimation. Effect of Carbon Sources on Protease Production: The effect of various carbon sources such as dextrose, lactose, sucrose, starch and maltose at the concentration of 1% was examined in the production medium for their effect on enzyme production. Effect of Nitrogen Sources on Protease Production: Various nitrogen sources like gelatin, Na2PO4, K2HPO4, beef extract and urea were supplemented individually to the culture medium for their effect on enzyme production by replacing 0.5% peptone in the production medium. Purification of the Protease: Ammonium sulphate precipitation is often used as the first purification step and concentration procedure. It is based on the principle of salting out. Protease was precipitated from the crude homogenate at varying concentrations of ammonium sulphate ranging from 0-100% (0-20%, 20-40%, 40-60%, 60-80%, 80-100%). The mixture was then centrifuged at 10,000 rpm for 20 minutes at 4 °C and the pellet was collected. The obtained pellet was re-suspended in a 10 ml of ice-cold 0.2M phosphate buffer pH 8.0 17. The protease activity and the total protein content in each of the ammonium sulphate precipitated fractions were estimated and were used to calculate the specific activity of protease. The fraction with the highest specific activity was dialyzed to facilitate desalting of the proteins 18. After 24 h the dialyzed enzyme fraction was subjected to Ion-exchange chromatography on DEAE-Cellulose column equilibrated with 0.2M phosphate buffer (pH 8.0). The fraction showing high protease activity was further purified with Sephadex G-100 column equilibrated with 0.2M phosphate buffer (pH 8.0). The fraction showing the highest peak was taken for the estimation of protein 19. Identification of the Protease-Producing Bacteria: From the primary screening of bacteria sixteen isolates were identified from termite soil samples. For all the sixteen isolates, both qualitative (zone of inhibition) and quantitative (U/ml) protease assays were done. Of these, only five of them showed protease activity. Among the five isolates, the isolate named “T1” showed maximum protease activity and was thus selected for further studies. The colony, morphological and biochemical characteristics of the bacteria isolated from the termite soil are presented in Table 1. Based on the Bergey’s manual of systematic bacteriology, the phenotypic characteristic of the organism was tentatively identified as the genus Bacillus sp. Phylogenetic analysis based on the 16S r RNA gene sequences indicated that the isolate T1 was Bacillus subtilis ASASBT Fig. 1. The obtained nucleotide sequence of Bacillus subtilis strain was submitted in GenBank database and the assigned accession number is MF618325. From the isolated Bacillus subtilis ASASBT, the presence of protease was confirmed by the zone of clearance on casein agar plate Fig. 2 and the maximum activity of 154.13U/ml was observed at 48 h of incubation at 37°C Fig. 3. This was also noticed in correlation with biomass production 20. The results further suggested that improved levels of protease production could be possible with high active production of biomass. The use of skim milk agar for the isolation of protease producing bacteria has been reported earlier by Boominadhan et al., and Haile & Gessesse 21 - 22. Hanan 23 reported that the proteolytic activities of all strains were assayed using skim milk agar and gelatin agar and exhibited a clear zone. Gelatin agar was the best than skim milk agar for qualitative test of protease. Several investigations have been done for the screening new isolates for protease production. Johnvesly et al., 24 pointed out that both Bacillus anthraces (126.09 U/ml) and Bacillus cereus (240.45 U/ml) exhibited their maximum ability to biosynthesize proteases within 60h incubation period. pH and Temperature: To optimize the pH for better protease production, the media were kept at varying pH ranging from 5 to 10. Maximum production of the protease (173.53 ± 1.97 U/ml) was obtained at the pH 7.0 Fig. 4. Temperature is also important environmental parameter. To optimize the temperature for higher protease production, the medium was kept in various temperatures ranging from 20 to 70 °C. The higher protease activity was found to be 173.13 ± 1.75 U/ml at 40 °C Fig. 5. Srinivas et al., 3 also reported that the maximum enzyme production was observed at pH 8 and 37 °C. Carbon and Nitrogen Sources: Nutrient sources were also found to be the important factors for protease production. Since carbon is one of the primary nutrients for bacteria, different carbon sources like dextrose, lactose, sucrose, starch and maltose were analyzed for protease production. The maximum production of protease 155.73 U/ml was observed when starch served as the carbon source Fig. 6. Hence, starch was found to be a better carbon source for protease production. Nitrogen also serves as an important nutrient source next to carbon for protease production. Hence, different nitrogen sources like gelatin, Na2PO4, K2HPO4, beef extract and urea were applied as nitrogen sources for protease production. Gelatin is found to be a better nitrogen source as it increases the production of protease upto 202.13 U/ml Fig. 7. Optimized production of a detergent-stable protease from Lysinibacillus fusiformis C250R, gruel, gelatin and yeast extract showed maximum production 25. Gupta et al., 26 reported glucose as the best carbon source for the alkaline protease production. Srinivas et al., was reported in his study that malt extract showed better enzyme production. Earlier reports suggested that among different genus, Bacillus has been found as a potent protease producer 27. Protease Activity, Protein Content and Specific Activity of Crude and Ammonium Sulphate Precipitated Samples of B. subtilis ASASBT: Ammonium sulphate precipitation was done in various range from 0 - 100%. The maximum protease activity and protein content was observed in the 40 - 60 % ammonium sulphate precipitated fraction (68.39 U/ml and 214 mg/ml respectively) when compared with the other fractions. The maximum specific activity was also seen in the 40 - 60 % precipitated fraction (29.96 U/mg) and hence this fraction was used for further purification Table 2. Protease Activity of Ammonium Sulphate Fractionated Dialysate from B. subtilis ASASBT samples: The 40 - 60 % precipitated fraction which showed maximum specific activity was dialyzed and the protein content and specific activity were noted. The protein content of the 40 - 60 % precipitated fraction had decreased from (214 to 129 mg/ml) after dialysis, but the specific activity had increased from 29.96 to 35.41 U/mg, which indicates the purification level. Klomklao et al., 28 are also reported the same. Elution Profile of Protease on DEAE-Cellulose Ion-Exchange Chromatography: The dialysate of the fractioned sample was further purified on DEAE-cellulose column. The fractions, which showed the highest peak were pooled and taken for the estimation of protein, the results of which are shown in the Fig. 8. The specific activity was found to increase from 35.41 to 62.00 U/mg as shown in the Table 3. The purification fold was 2.87. Elution Profile of Sephadex G-100 Gel Filtration Chromatography Purified Protease: The DEAE-cellulose fractioned sample was further purified on sephadex G-100 column. The fractions, which showed the highest peak were pooled and taken for the estimation of protein which as showed in Fig. 9. The specific activity was found to increase from 62.00 to 86.51 U/mg which is shown in the table and the purification fold was found to be 4.01. These findings were in accordance with the report of El-Beltagy et al., 29. Thus the use of micro-organisms to produce enzymes have a number of technical and economic advantages and in recent years it has become the predominant mode of enzyme production 30. CONCLUSION: In the present investigation, several protease-producing bacterial species were isolated from termite soil collected from agricultural area in Karur District, India. Among these strains, Bacillus sp. was isolated and selected for further studies since it appeared to be the best producer of extracellular protease. The bacterial isolate were characterized and identified as Bacillus subtilis ASASBT. The maximum protease production by the Bacillus subtilis ASASBT was attained at 48 h of incubation, the impact of physical parameters like pH, temperature, carbon and nitrogen sources on protease production by isolated Bacillus subtilis ASASBT were also investigated. Among the different pH and temperatures studied, pH 8 and 40 °C respectively were found optimum for the protease production. The protease production was maximum with starch and gelatin as a carbon and nitrogen sources. The enzyme has been isolated and purified by ammonium sulphate precipitation in varying concentrations ranging from 0-100%, dialysis, DEAE-Cellulose ion exchange chromatography, Sephadex G-100 gel filtration. Ammonium sulphate (40-60%) saturation showed higher protease activity and gave a yield of 65% of the enzyme. The protease activity and recovery percentage of the dialyzed sample were decreased, specific activity and purification fold were increased when compared with the ammonium sulphate precipitation (40-60%). A similar trend was observed in DEAE-Cellulose ion exchange chromatography and Sephadex G-100 gel filtration chromatography. The isolated Bacillus subtilis strain produces the protease enzyme which has the potential to produce good quality protease and this can be wide spread usage in detergent, food and pharmaceutical industries. ACKNOWLEDGEMENT: The authors would like to thank Department of Biochemistry, Biotechnology and Bioinformatics, Avinashilingam Institute for Home Science and Higher Education for Women, Coimbatore for the facilities and constant encouragement. The authors express their thanks to Centre for Biosciences and Nanoscience Research, Coimbatore for their timely help. Mohammad BD and Mastan SA: Isolation, characterization and screening of enzyme producing bacteria from different soil samples. Intl. J. of Pharma & Bio Sci. 2013; 4(3): (B) 813-824. Rupali D: Screening and isolation of protease producing bacteria from soil collected from different areas of Burhanpur Region (MP) India. Int. J. of Current Microbiol and App. Sci. 2015; 4(8): 597-606. Srinivas NL, Aruna K, Sreevennela P and Vebkata Devi CR: Isolation and biochemical characterization of protease isolated from Bacillus sp Intl. J. of Res. in Pure & Appl. Microbiol. 2013; 3(3): 94-101. Thirumala M and Vishnuvardhan RS: Production, purification and characterization of a thermotolerant alkaline serine protease from a novel species Bacillus caseinilyticus. 2016; 6: 53. Abbas AS and Leila J: Effect of culture conditions on the production of an extracellular protease by Bacillus, isolated from soil sample of Lavizan jungle park. Enz. Res. 2011; 1-7. Kumar D, Savitri N, Thakur R, Verma and Bhalla C: Microbial proteases and applications as laundry detergent additive. Res. J. of Microbiol. 2008; 3(12): 661-672. Maroua OB, Emna M and Mouna BE: A novel organic solvent and detergent-stable serine alkaline protease from Trametes cingulata strain CTM10101. Intl. J. of Bio. Macromol. 2016; 91: 961-972. Sneath HAP and Halt GJ: Bergey’s Manual of Systematic Bacteriology. Baltimore MD, Williams and Wilkins. 1986; Second Edition. Ausubel F, Brent R, Kingston R, Moore D, Seidman J and Smith J: Current protocols in molecular biology. New York-Greene Publishing Association, Wiley-Interscience. 1992. Castresana J: Selection of conserved blocks from multiple alignments for their use in phylogenetic analysis. Molecular biology Evol. 2000; 17(4): 540-52. Saitou N and Nei M: The neighbor-joining method: a new method for reconstructing phylogenetic trees. Mol. Biol. Evol. 1987; 4: 406-425. Edgar RC: Muscle: a multiple sequence alignment method with reduced time and space complexity. BMC Bioinformatics. 2004; 5: 113. Pant G, Prakash A, Pavani JVP and Bera S: Production, optimization and partial purification of protease from Bacillus subtilis. J of Taibah Univ for Sci 2015; 9: 50-55. Olajuyigbe FM and Ajele JO: Production dynamics of extracellular protease from Bacillus Afr. J. Biotechnol. 2005; 4: 776-779. Lowry OH, Resebrough NJ, Farr AJ and Randell RJ: Protein measurement with the Folin phenol reagent. J. Biol. Chem. 1951; 193: 265-75. Sevinc N and Demirkan E: Production of protease by Bacillus N-40 isolated from soil and its enzymatic properties. J. Biol. Environ. Sci. 2011; 5: 95-103. Simpson RJ: Purifying proteins for proteomics: A Laboratory Manual Cold Spring Harbor Laboratory Press, New York. 2004. Roe S: Protein purification techniques: A practical approach, second edition, Oxford University Press, New York. 2004; 38 (47): 130-131. Sookkheo B, Sinchaikul S, Phutrakul S and Chen ST: Purification and characterization of the high thermostable proteases from Bacillus stearothermophilus Prot. Exp. Purification. 2000; 20: 142-151. Sujatha A and Subash A: Isolation and screening of extracellular protease produced by Bacillus subtilis from Termite soil. 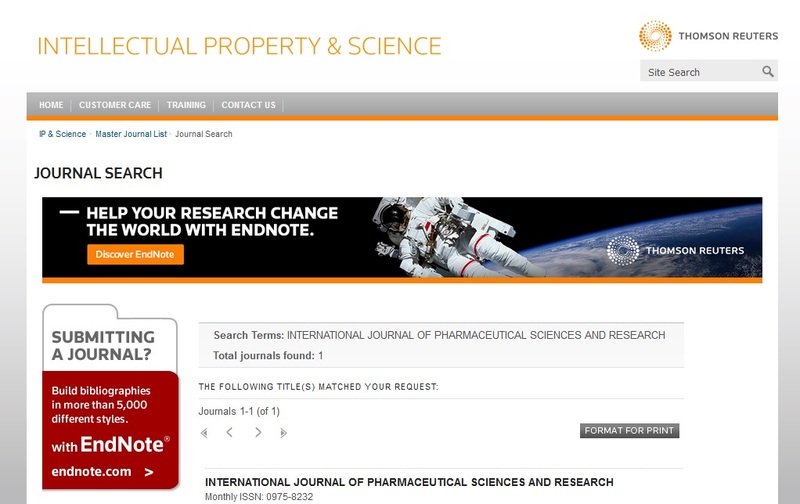 Life Science: Research, Practices and Application for Sustainable Development. Conference Proceeding. 2017; 708-713. Boominadhan U, Rajakumar R, Karrpaga PVS and Joe MM: Optimization of protease enzyme production using Bacillus, isolated from different wastes. Botany Res. Int. 2009; 2: 83-87. Haile G and Gessesse A: Properties of alkaline protease C45 produced by alkaliphilic Bacillus sp., isolated from Chitu, Ethiopian Soda Lake. J. of Biotech. and Biomat. 2012; 2: 1-4. Hanan SA: Isolation and screening of extracellular proteases produced by new isolated Bacillus , J. App. Pharm. Sci. 2012; 2(9): 071-074. Johnvesly B, Manjunath BR and Naik GR: Pigeon pea waste as a novel, inexpensive, substrate for production of a thermostable alkaline protease from thermo alkalophilic Bacillus , JB-99. Bioresour Technol 2012; 82(1): 61-64. Sondes M, Mouna K and Mouna BEB: Optimized production and characterization of a detergent-stable protease from Lysinibacillus fusiformis Int. J. of Biol. Macromol. 2017; 101: 383-397. Gupta R, Beeg QK, Khan S and Chauhan B: An overview on fermentation, downstream processing and properties of microbial alkaline proteases. Appl. Microbiol. Biotechnol. 2002; 60(4): 381-395. Jalkute CB, Waghmare SR, Nadaf NH, Dhanavade MJ, Jadhav DB, Pendhari SI, Patil RS and Sonawane KD: Purification and characterization of SDS stable protease from Bacillus safensis strain CK. Biocat. & Agricul. Biotech. 2017; 10: 91-95. Klomklao SA, Benjakul SB, Kishimura HC and Chaijan MD: 24 KDa Trypsin: A predominant protease purified from the viscera of hybrid catfish (Clarias macrocephalus, Clarias gariepinus). Food Chem. 2011; 129: 739-746. El-Beltagy AE, El-Adawy TA, Rahma EH and El-Bedawey AA: Purification and characterization an alkaline protease from the viscera of Bolti fish (Tilapia nilotica). J. of Food Biochem. 2015; 29(5): 445-458. Harish R and Chauhan BJ: Isolation, characterization of protease producing microbes from soil of agricultural land and purification of protease. Int. J. of Pharma Res. and Health Sci. 2017; 5(1): 1581-1585. Sujatha A and Subash A: Isolation and purification of an extracellular protease from Bacillus subtilis ASASBT isolated from termite soil. Int J Pharm Sci & Res 2018; 9(11): 4812-19. doi: 10.13040/IJPSR.0975-8232.9(11).4812-19. Authors Address: Department of Biochemistry, Biotechnology and Bioinformatics, Avinashilingam Institute for Home Science and Higher Education for Women, Coimbatore, Tamil Nadu, India.